With depictions in artwork from as early as the 8th century, the ancient Briard is a French dog breed that has been employed in diverse roles throughout its history, but is most commonly recognized as a herding breed or as a guard dog for flocks of sheep. 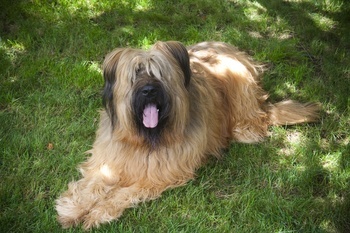 Though documentation of its early history is sparse, the first breed standard for the Briard was written in the late 19th century and the breed was accepted for registration by the AKC in 1922 after being brought to North America from Europe (including Briards imported by Thomas Jefferson). Praised for their intelligence and memory, the Briard is a naturally protective dog that can benefit from early and extensive socialization in order to establish proper boundaries and temperament toward strangers. They are often regarded as extremely loyal and bonded to their owners and appreciate significant time with their human “pack”. Though the breed is regarded as relatively healthy, as with most purebred dogs, the Briard has developed some inherited disease concerns during its path to the modern state of the breed. One of the best known Briard inherited disease concerns, unique to the breed, is a disease known as congenital stationary night blindness (CSNB) caused by a mutation in the canine RPE65 gene. CSNB is an inherited, slowly progressive disease resulting in blindness of variable severity in the Briard. Affected dogs are commonly born with night blindness (due to abnormal rod cells function of the retina) that can first be determined around 5 to 6 weeks of age when puppies are first commonly tested for visual impairment. Some dogs may have complete blindness at birth (due to the additional presence of abnormal cone cells, the other photoreceptor cell type of the retina) while others may develop complete blindness with time as the disease slowly progresses. Though veterinary examination of the retina in young dogs is generally normal, dogs will often develop obvious retinal abnormalities as they age. Though there is not currently a commercially available treatment, a genetic therapy restoring vision to CSNB-affected dogs was described in 2001. The therapy was heralded as a major breakthrough for humans as well because approximately 10% of people inheriting a disease similar to CSNB, known as Leber congenital amaurosis (LCA), have a mutation in the human RPE65 gene. In 2007, people with LCA were also successfully treated with gene therapy, thus restoring their vision to variable degrees. Unfortunately, in May 2015, it was reported that the successfully treated human patients began experiencing vision loss again around 1 to 3 years after the gene therapy was conducted. Further research into these conditions is needed to determine the exact cause of disease recurrence and to understand how the gene therapy methods previously used can be modified to allow for longer remission states for both humans and dogs. Until a low cost, effective treatment is developed, genetic testing of breeding dogs and informed selective breeding are going to remain the most humane, cost effective, and easiest way to eliminate CSNB. CSNB is inherited in a recessive fashion meaning that dogs must inherit two copies of the RPE65 gene mutation (one from each parent) in order to be affected with the disease. Dogs inheriting only a single copy of the mutation are considered carriers of CSNB, but will not show clinical signs of the disease themselves. However, carriers can produce affected dogs if bred with another carrier of the same mutation. Therefore, in order to prevent puppies from being born with CSNB, it is important to only breed carriers of the CSNB mutation to dogs that have not inherited the mutation. As with most genetic diseases, it is not recommended to breed affected dogs. Paw Print Genetics offers testing for CSNB in the Briard along with genetic testing for diseases in over 200 breeds of dog. If you have questions about how you can eliminate CSNB from your kennel or have a specific canine genetics question, please contact the Paw Print Genetics laboratory at AskUs@pawprintgenetics.com or give us a call at 509-483-5950. We do not have an automated phone system and we are very happy to help all dog lovers understand the genetics of their dogs!